Our planet is suffering from serious environmental problems: coastal flooding due to severe storms caused in part by atmospheric pollution, diminishing natural resources such as clean water, and so on. But while these problems plague Planet Earth, two-thirds of our globe is Planet Ocean. The seas can be home to pioneers, seasteaders, who are willing to homestead the Blue Frontier. Oil platforms and cruise ships already inhabit the waters; now it's time to take the next step to full-fledged ocean civilizations. 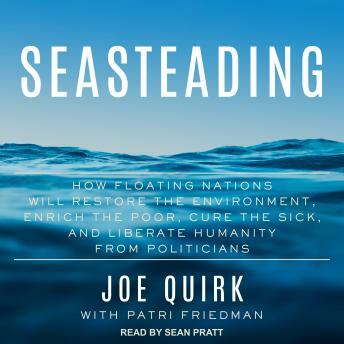 In their fascinating examination of a practical solution to our earthly problems, Joe Quirk and Patri Friedman profile some of the visionaries who are implementing basic concepts of seasteading: farming the oceans for new sources of nutrition; using the seas as a new sustainable energy source; establishing more equitable economies; reinventing architecture to accommodate the demands of living on the ocean.